Or, more accurately, vodka plus loads of lemons. Limoncello is an Italian lemon liqueur made by infusing a clear spirit (such as vodka) with lemon zest, then adding sugar. I am partial to making DIY liqueurs. So I was intrigued to read about home-made limoncello in Appetite Magazine, which I picked up in Newcastle (a fave city, not to mention home of middle daughter, Sarah – one of her projects is Girl Kind). The recipe did not mention what to do with the lemons after removing their zest. I could not countenance wasting them! *So I blitzed the peeled lemons (pips and all, being more domestic slattern than goddess) with my trusty wand blender, adding their strained lemony goodness to the concoction. The white fibrous pitch can be bitter so I removed as much as possible before whizzing (see pic above). Alternatively, squeeze the peeled lemons for lemon juice, adding to the potion at the point when you add the boiled sugar and water. Use organic lemons if possible because organic lemons are juicier and, (the domestic slattern in me again), do not require washing/scrubbing before use in order to remove traces of chemicals. A recent report from Pesticide Action Network UK found 100% of soft citrus fruit had pesticide residues. Peel lemons with a potato peeler, adding the zest (or thin peel) to a litre of vodka. Leave for 10 days – 1 month in a dark place to infuse the vodka with a citrus flavour. Strain and consider adding fresh new zest. Add 675g of sugar to a litre of water in a pan and bring it to the boil, simmering for 15 minutes. Add the cooled sugary water to the infused vodka. For added lemony-ness, add the juice from the peeled lemons to the concoction. *Or whizz the peeled lemons as I did for additional fresh tangy fruitiness. Here is a pic of my late mum, Fay, aged 93 at Carluccio’s. My mother died in January 2017 the same year as Carluccio’s founder, celebrity chef, Antonio Carluccio. Fay once told Antonio that his restaurants were not the same since he sold the brand. How did he respond, I asked? He shrugged, she said, non-commitally. Fay would always finish a meal at an Italian restaurant with a limoncello (or two). The pic below was taken at Carluccio’s in 2016, livening up a hospital appointment at Chelsea & Westminster. Instead of bacteria being our deadly foe, it turns out the vast majority are really our best friends – and our oldest. According to the Human Microbiome Project, our ‘live-in’ molecules – the single cell organisms including bacteria and fungi that are neither plant nor animal but in a category of their own – have evolved symbiotically with us and our pre-historic ancestors since time began. Like the best of relationships, we are inter-dependent. We provide energy via food to our single-cell friends: in return, they perform a myriad of life-giving activities. As it is in our gut, so it is in the soil. The idea articulated by Sustainable Food Trust, director Patrick Holden, that healthy topsoil thrives because of microbial activity – functioning in a similar way to human digestion – illustrates the interconnectedness of everything. In the dark of topsoil, microscopic microbes perform vital tasks to maintain the health of soil life. Meanwhile, in the dark of our digestive system, trillions of tiny microbes are likewise busy keeping our bodies healthy. The role of beneficial bacteria is multi-functional. A key role of both soil and gut bacteria is digestion. These beneficial bacteria break down nutrients into digestible forms that can be assimilated by the plant’s roots, or the gut lining in our intestines, enabling both plants and humans to thrive. As well as bacteria being an essential component of digestion, beneficial bacteria also help to repel disease and are a key component of a healthy immune system. The number of microorganisms living invisibly in the world is mind-boggling: one teaspoon of rich garden soil can hold one billion bacteria along with fungi and other microorganisms. As for the bacteria in a symbiotic relationship with us, the majority live in the walls of our intestines. This community of diverse bacterial species, called the gut microbiome, weighs about two kilos. There is a clear analogy between soil and human digestion and, according to nutritionist and author Daphne Lambert, there is also a direct relationship. In her book Living Food: A Feast of Soil and Soul, she traces the origins of soil eating for health, drawing on recent studies to argue for increased exposure to soil to build immunity. According to Daphne Lambert, there is evidence to suggest that the ingestion of soil-based organisms from a vibrant, healthy soil enhance the functioning of our gastrointestinal tract. But our modern lifestyles break the link between healthy soils and healthy humans, with fewer people than ever before working on the land and every last trace of soil washed off the vegetables we buy. But what about the scary bugs? Small children are naturally drawn to soil but it’s usually us adults who start freaking out about the dirt. Take heart that the benefit of handling soil far outweighs the risks. First, the good bacteria outnumber the bad. Second, we develop the capacity to deal with the bad ’uns by the very practice of being exposed to microbes in the first place. Initially proposed in 1989, the hygiene hypothesis in medicine shows that we do small children a disservice by keeping them in a sterile environment. Getting down and dirty is how our immune system learns to defend us from disease. Children who develop healthy immune systems in this way will doubtless be better able to resist infections. However, a word of caution: a great deal of our soil has had its inherent health degraded by intensive agricultural methods and intensive farms can be breeding grounds for dangerous bacteria such as E.coli O157, so hand washing hygiene is called for in some situations. Ideally, we should be able to ditch our antibacterial cleaners too. Rather than obliterating all bacteria, we could take a leaf out of traditional Asian cultures and clean our houses with a fermented solution of probiotics that feeds good bacteria, which then eat up the bad smells, dirt and grease caused by harmful bacteria. (Yet, in our spoiled and imperfect world there will be exceptions here too, and caution is needed, especially when preparing chicken, which is so often a source of campylobacter infections). Just as we can colonise our homes [I swear by Libby Chan probiotic cleaner!] and soil with good bacteria, so we can restore health to our gut. When it comes to the human diet, nutritional therapists commonly agree that the best way to create good gut bacteria via what we eat is to eat more as our ancestors ate and adopt a three-step approach: reduce sugar, raise fibre and eat fermented foods. Take sugar first. Or rather don’t! Bad bacteria feed on sugar and they start complaining when they don’t get it. Based on a review of recent scientific literature, US researchers found that gut microbes may cause us to crave the very nutrients they need to grow, by releasing signalling molecules into our system. Finally, fermented foods are important. Bacteriology may be in its infancy, but, according to author and food campaigner, Michael Pollan, every traditional food culture has fermented food in its diet. Think sauerkraut, chocolate, tamari and kimchi. Fermented foods are low-energy – they require no cooking or refrigeration. By preserving summer foods throughout long winters or saving food from decomposition in tropical heat, humans have survived inhospitable climates. Captain Cook famously took sauerkraut (fermented cabbage) to reduce scurvy on his sea voyages. 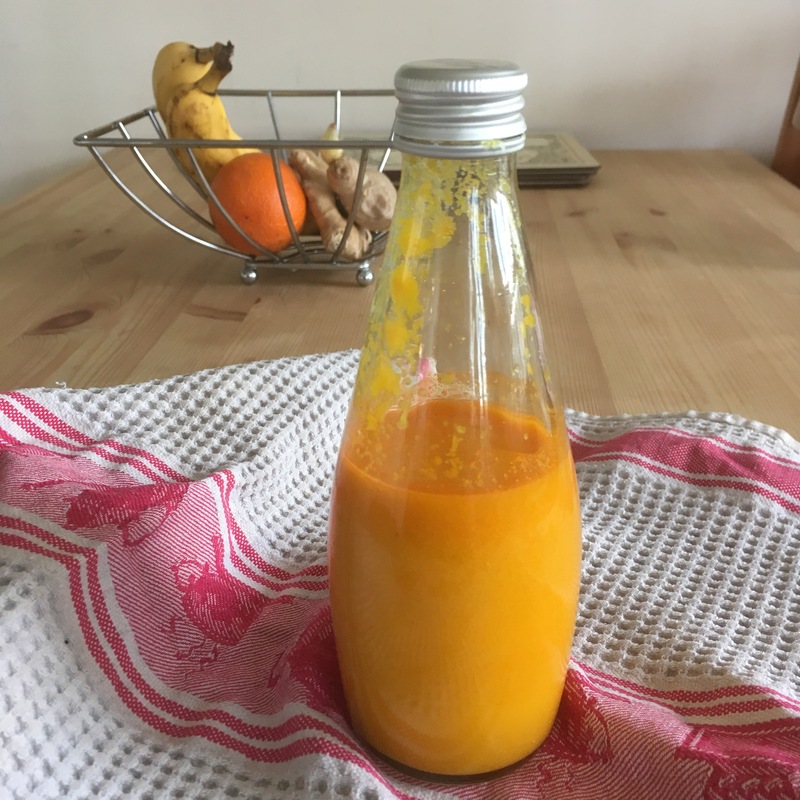 Check out fermentation workshops including by Daphne Lambert, [and Annie Levy who turned me on to the joys of fermentation by sending me a jar of kimchi through the post!]. Most bacteria are notoriously hard to culture in a petri dish, so our knowledge of bacteria’s many uses is still severely limited. One of the most widely known bacteria is Lactobacillus acidophilus – the Latin for acid-loving milk bacterium – which predigests food, transforming, for instance, milk into yogurt. The following is from a collection of over 80 recipes from Daphne Lambert’s excellent book, Living Food: a Feast for Soil and Soul, which celebrates a gastronomy that is good both for human and planetary health. Cabbage is cheap to buy. Once fermented, it adds complex and delicious flavours – one of the joys of life. Shred the cabbage and place it in a large metal bowl. Sprinkle over one tablespoon of salt and pound gently with a wooden rolling pin to help pull the water out of the cabbage. Cover with a cloth and leave overnight. The next morning, place about two inches of cabbage into the glass jar and press firmly down, sprinkle with a little salt and repeat until the jar is full. As you layer up you can add spices and herbs to flavour. Firmly compress the layers of cabbage. Place a weight on top like a jam jar filled with water to make sure the cabbage is completely submerged by the brine (if necessary add a little water). Cover with a cloth to protect from flies. Every day, push the cabbage gently down. Let the jar sit at room temperature. After a week the cabbage has fermented sufficiently to be eaten, but you can leave it for a further couple of weeks. If you are not going to eat the cabbage straight away, fit with a lid and store in a cool, dry place where the tangy flavour will continue to develop. Once you start eating the cabbage, keep it in the fridge. Many grains in different parts of the world are made more digestible through fermentation: in Japan, the soya bean is fermented into traditional fermented foods such as tempeh, soy sauce and miso. In Africa, millet is fermented for several days to produce a sour porridge called ogi, and in India rice and lentils are fermented for at least two days before making idli and dosas. Corn was fermented before using in Mexico, and, throughout Europe, grains used to be soaked overnight in soured milk ready to make porridge in the morning. It’s easy to start soaking grains and this simple process is an enormous aid to digestion. Soak your chosen grain in water for a minimum of eight hours at room temperature. You can assist the process by adding a little fermented (sauerkraut) vegetable juice or yogurt. By fermenting the whole oat grouts (whole oats) before cooking, the flavour of the porridge is enhanced, the grains are more digestible and there is greater nutrient bioavailability. Place oat grouts in a bowl, just cover with water and leave at room temperature for two days. You can leave for longer if you choose to create a more intense acidic flavour. To assist the process, add a tablespoon of sauerkraut juice, apple cider vinegar or kefir to the water. Strain the oats, saving the soak water, then simply eat the grains as they are with soaked nuts and seeds and seasonal fruits. Alternatively, you can cook the grouts, either in the soak liquid or fresh water, depending on your flavour preference. Gently heat the oats and cook very slowly until thick and creamy. Add a pinch of salt and serve with whatever you fancy. May your good bacteria flourish! I love a good tonic. Here is one I concocted to boost my immune system last week when I played York in six shows over four days (the closest I have come to doing an extreme sport, ever.). The play was a regendered production (hence me as York) of Henry VI Part 3 by feminist Shakespearian ensemble company, The Barded Ladies. Things got done with encouragement, creativity and playfulness, rather than dominance and criticism. Made me hopeful: you can run the world without being a bully. I used turmeric root and ginger root. Try health food stores, or greengrocers’ especially Middle Eastern or African ones. (Omilord, can you imagine how bland food would be in the UK – without immigrant cuisine?). Peel the roots and cut up small. 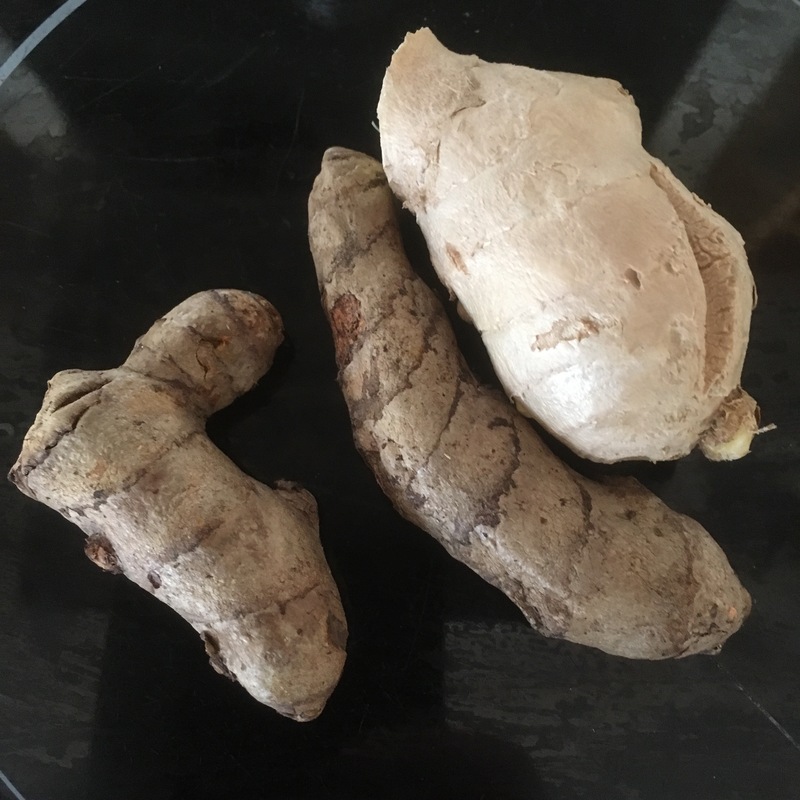 If no roots can be found, use 1-2 teaspoon each of turmeric and ginger. Add the juice of 4 squeezed lemons – organic ones tend to be smaller but juicier. (I have just discovered Sunita from squeezed organic Sicilian lemons. I felt a right cheat but it uses no preservatives, so there is no chemical aftertaste). 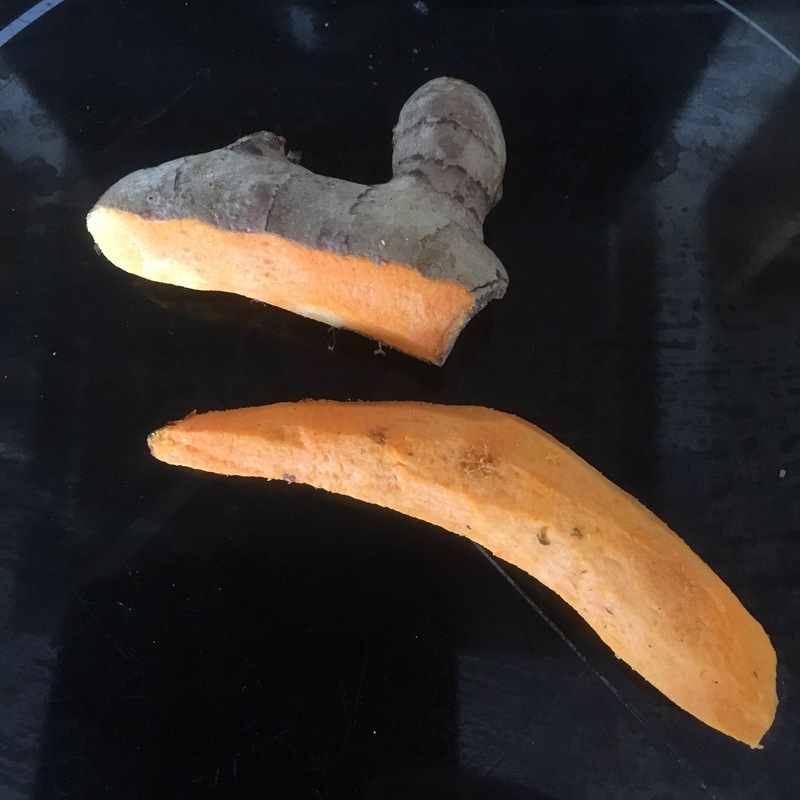 Stop press: Add black pepper and oil to the concoction to increase bio-availability of the turmeric. (Thanks, Jane!). Add runny honey to taste. Whizz all together with a hand blender. 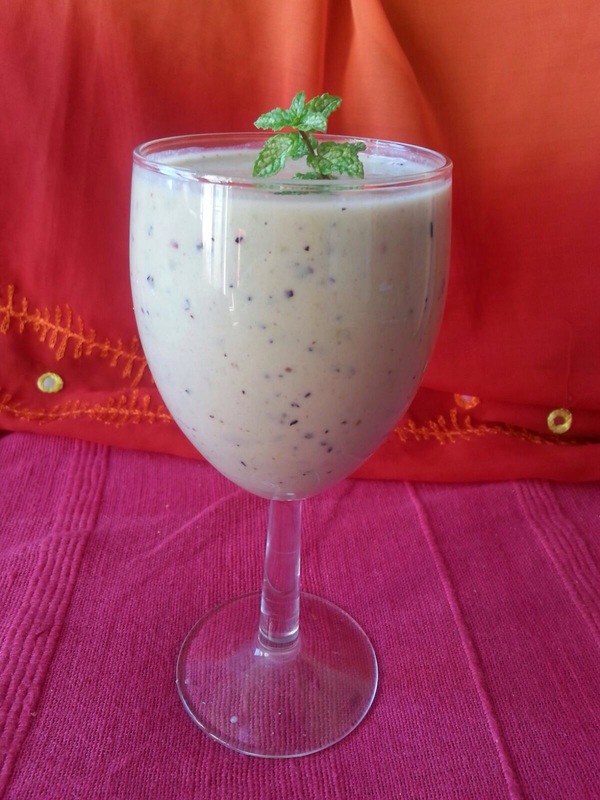 A wide awake tangy taste in smoothies AND a savoury dressing. And, of course, for sipping backstage. Sore throat? Use the whole lemon! Yeah, yeah, I know about lemons. Indeed, lemon water – a squeeze o’ lemon in water plus the peel – is my daily, refreshing, health-giving drink. The whole lemon? A revelation. Lemons deliver an impressive 187% of a person’s daily value of Vitamin C, as well as a host of other disease-fighting nutrients, according to Dr Mercola. So I squeeze the juice of a whole lemon in a mug of boiling hot water and add a dessertspoon of honey. Don’t stint on the honey. It makes it delightful to drink – and honey adds health-giving properties. I cannot mention honey without comment: How outrageous that pesticides used by chemical agriculture are killing our beautiful bees. My throat felt much better. So I made myself another hot drink with the juice of a whole lemon. And my sore throat was cured. I also reach for the raw ginger, and raw garlic, when under-the-weather. What are your favourite natural remedies? Right now, I am all about the potions. It all started when a friend gave me sloe berries from her freezer – and the thorn from the sloe berry bush to prick them to release their juices. I drink rarely but when I do I like cocktails, and liqueurs. But I don’t like: the sicklyness of too much sugar, and additives instead of real ingredients. Apricots soaked in brandy – I used Hunza apricots which have a small stone and fine pedigree (one of the founders of the organic movement, Sir Robert McCarrison, learnt about nutrition in the 1920s from the Hunza tribe in Pakistan, so impressed was he by their health and vitality compared to sickly English people. The Hunzas are known for their longevity, thanks to their wholesome diet). Make sure the apricots are completely covered with the brandy. The apricots soak up the alcohol and swell, so leave room in your glass container for this effect. Whiskey zapper – 200 mls whiskey + 300 mls expresso coffee + 400 mls coconut milk + agave nectar. You don’t need to use expensive spirits – the natural flavours will enhance the potion. Drink responsibly, and drink water too. Happy shiny new 2016 year! Start the day with a health-boosting refreshing fresh fruit drink. You need an electric hand-blender to do the whizzing. I use the cheapest, least fancy (about £20) – my most valuable and versatile piece of kitchen technology. 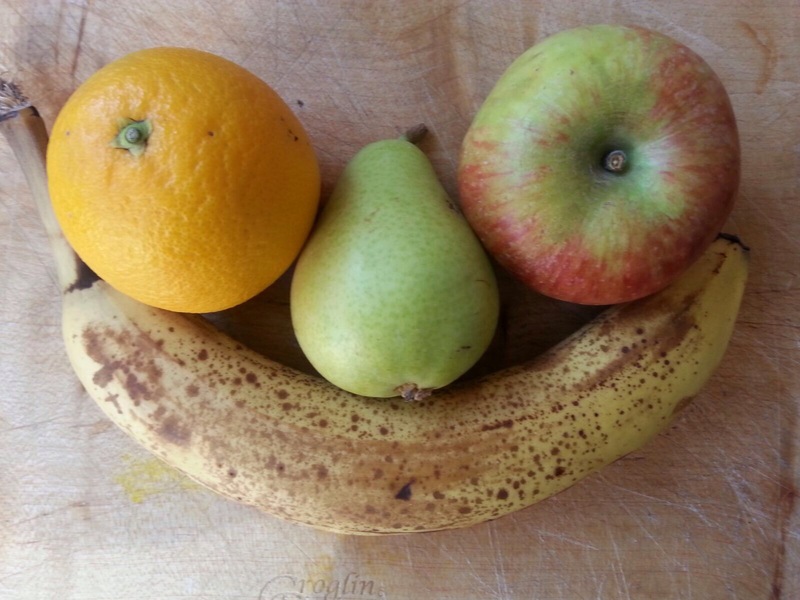 Banana is the base – add fruit such as apple/pear/orange/berries. Use the whole apple/pear: whizz it up, pips, peel and all. 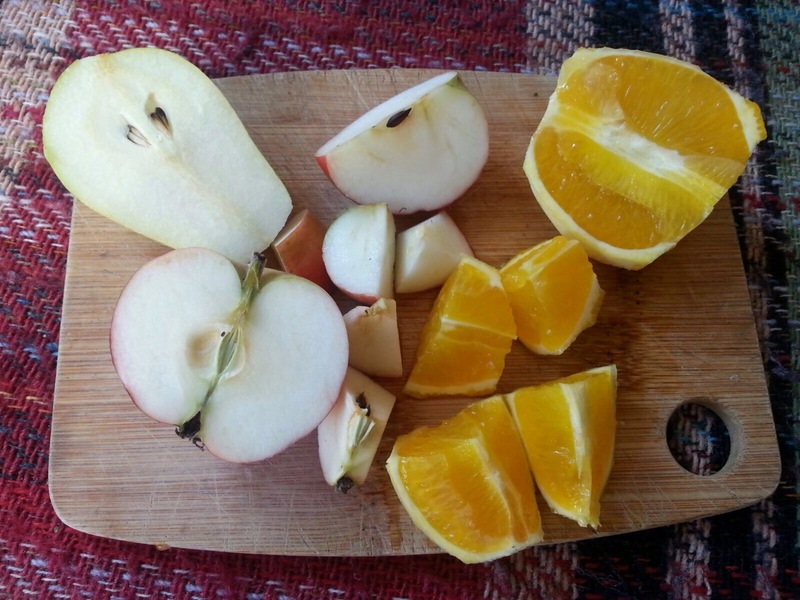 Don’t even peel the apple/pear (especially if organic). Yes, take stones out of mango/peach/plum/apricot. (Blender blade can’t cope). But no need to de-pith orange. Whizz it up with pith, and pips. I learned this time-saving tip at a raw food workshop by Kira G Goldy. Kira is also a healer. As a journalist, a challenge. But her words rung true. I focused on writing and two things have developed from my new intention. I give courses to facilitate creative writing (and at the same time teach myself as it turns out). And I have written a verbatim play based on interviews of people facing eviction in the hyper-regeneration of Brixton, and Lambeth council estates. Verbatim is like journalism because it is entirely made of people’s quotes, like a documentary. The subject – how profit-driven thinking wrecks human lives – is a subject close to my campaigning heart. The play is a collaboration with Changing Face Collective and director Lucy Curtis. Where Will We Live? premieres at Southwark Playhouse on 25 – 28 November 2015. I will need to keep my strength up. Time to make an easy smoothie! Use organic fruit if possible. Why organic? Blend with a hand-blender in a jug, pour and enjoy.